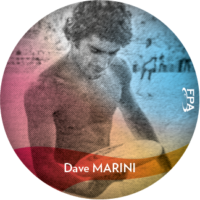 Dave Marini was strong, gifted, athletic and charismatic. His play with partners Doug Corea and later Johnny “JJ” Jewell were classic state of the art styles of play for their time. But Dave will forever be remembered for his contributions away from the playing field. He created the Freestyle Players Association in 1980 and stands alone as the key figure in creating an independent freestyle governing body.